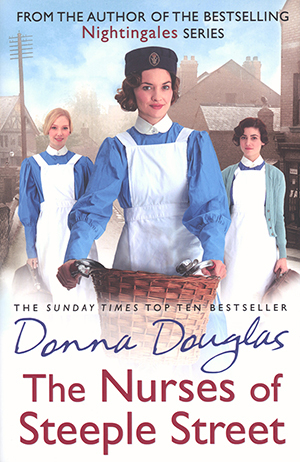 Valerie McGurk reviews The Nurses of Steeple Street, a new novel from the author of the Nightingale series. Valerie McGurk reviews the latest book from the author of the Nightingale series. This new novel from the author of the Nightingale series, The Nurses of Steeple Street, does not disappoint. Set in a mining town in the 1920s, it follows district nurses Agnes and Polly in their day-to-day encounters and care rounds. Polly works under the watchful eye of her mother Bess, but their relationship becomes more strained when Polly falls in love and, looking for her mother’s approval, learns the truth about the father she doted on. Meanwhile, Agnes, who is in her probationary period, is looking for a fresh start after losing the love and respect of her family. She believes her training at the Nightingale has prepared her fully for work in the community, but is assigned to Quarry Hill, a notorious slum. There she visits patients and families in their homes, and witnesses poverty up close. The reader is drawn to Agnes, who learns new ways of working and begins to build relationships with patients. As the nurses seek to overcome their past and secrets come to light, the characters become more endearing. There is Christine, a young girl who wins a scholarship, works hard and doesn’t want to disappoint her family, but ends up pregnant. We meet the Willis family, who believe Agnes looks down on them, and Isaiah Shapcott, whose ill treatment in the workhouse has given him a fear of having a bath. This book doesn’t disappoint. Written in a warm and friendly style, it draws the reader in, and the characters feel like friends and family. A pleasant and enjoyable read for anyone with a love of nursing. Guy’s and St Thomas’ NHS Foundation Trust has launched The Nightingale Nurse Award. Why should I have to use a catheter?